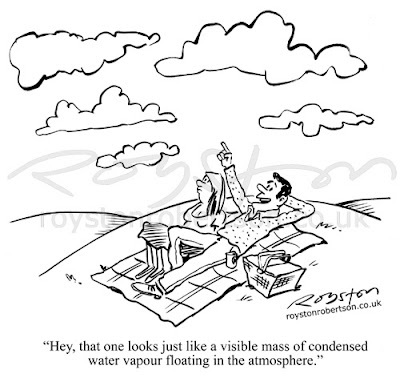 "Hey, that one looks just like a visible mass of condensed water vapour floating in the atmosphere." I got such a positive reaction to this cloudspotting cartoon which appeared in print a year ago, that I immediately tried to come up with more cartoons on the subject. 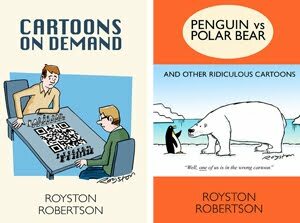 The cartoon above is one of them and can be seen in this week's Private Eye. As I've mentioned here before, there can be a large gap between a magazine taking a cartoon and it appearing in print. This one was taken in early March 2010, so it has been almost a year. That's nothing though, I think my personal record is still two years, as mentioned here, and I've heard of even longer waits from other cartoonists.